All transactions are safe and secure with a reliable history in online purchasing behind each of our associates. Buy the Vincent Chase ADHD t-shirt to own Entourage clothing and merchandise. This funny Entourage t-shirt features an ACDC rock'n'roll style logo. The letters in the logo have been changed to read, "ADHD," which stands for Attention-Deficit Hyperactivity Disorder. Vincent Chase wears a similar ADHD t-shirt on the HBO Entourage TV show. It can be seen during the season three episode where Johnny Drama tries to avoid seeing any reviews for his new TV series. 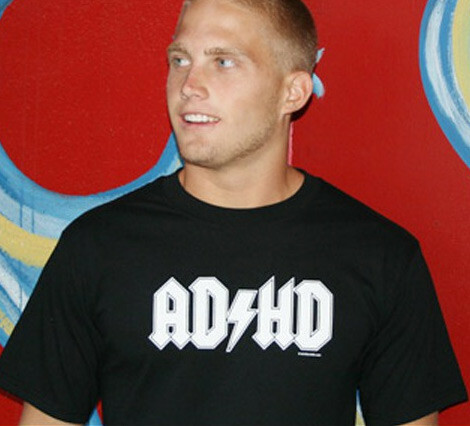 Now you can wear your own ADHD tee... if you can sit still long enough to place the order. In addition to the Vincent Chase ADHD tee above, browse the Entourage Clothing Gallery for more apparel like men's and women's clothes, kids shirts or hoodies.